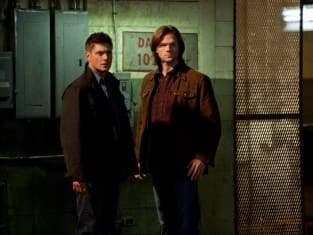 Supernatural spun a classic Greek myth on last week's "Remember the Titans," giving the episode a special Winchester twist of course. Carissa: Pretty much everything out of Dean's mouth was golden this week. I can't remember anything specific but I just kept smiling and thinking "that would be great to bring up!" Dementia then set in and I lost it all. I do recall particularly enjoying the looks on his face as he realized just how much Sam has been learning in their new lair. Jensen Ackles is really quite masterful at non-verbal communication. Oh! I almost forgot. The proud look on his face as he said "We're legacies" was also perfect. Ackles was on fire! Alice: I didn’t have a favorite scene, so I’ll just do the favorite quote. It’s the best quote of Supernatural season 8 so far. Sam: What do we know that has Jason Bourne fighting skills, dies a lot, and has a history with violent women? Dean: I don’t know, you? Sean: The scene where Sam was trash talking Artemis was hilarious. Not only was Sam stepping up on an instinct he felt, but Dean's facial expressions to each comment were priceless. Did you enjoy the Supernatural take on the Greek myth between Zeus and Prometheus? Carissa: I did. I remember a conversation with Ben Edlund about Sam and Dean being demi-Gods, so I thought it was fun to see the real thing brought into the picture. I'd like to see more surprising genre mix-ups on Supernatural. Why not? This season alone we've encountered Nazis and Greek Gods. Time for the aliens to invade! Alice: It was okay. It seemed weird to me to take on such legendary Gods in a throwaway filler episode. Couldn’t it have been lesser known Gods? It was well done, but I have a hard time believing that not only could Zeus be summoned that easily, but that he could be killed (maybe). Wasn’t he the mightiest of all Gods? I liked Prometheus though and found him believable, as believable as running into an ancient Titan in modern times could be anyway. Sean: I liked parts of it in the sense that the show did touch on the Greek mythology. That said, I could totally see them being season long villains rather than just a one episode kind of thin. I agree with Alice about Zeus probably should have been way more powerful. Was Zeus a fun villain and should he return? Carissa: Zeus in particular was a bit of a dud, but I'd definitely be open to more Greek mythology, or any other mythology for that matter. It keeps the show fresh. Alice: No, sadly he was tame. I expected someone less petty on revenge and a bit more wiser and commanding. Longer hair and a flowing white robe too. Yes, I’m more of an original Clash of The Titans fan. So no, I don’t want him back in the “Supernatural” realm. Sean: I thought Zeus was fine, but I think I wish it was more conveyed that he was a super powered god and not one so easily summoned. That said, I'm still open to exploring the Greek gods even further. How did you think Sam handled getting Artemis to stop her father, or working on the case in general? Carissa: It goes back to what he's learning in their new home. Having not had the chance to finish his college education, he's taking full advantage of this new opportunity to fulfill his family's legacy as a Man of Letters. On the other hand, he's realized he might have bitten off more than he can chew with closing the gates of hell, so I hope he finds something helpful in those books to help him out. Alice: I’m just so happy that he and Dean finally got to use the Men of Letters library to solve a case! Work is proving to be a good distraction for all Sam’s physical troubles and recent doubts about the trials so at least his head is still in the game. Lucky for him, this week’s case gave him a chance to embrace his inner geek (he’s adorkable!). He had to go against conventional Greek mythology too since Artemis is a man hater, so luckily his ability to read people is still in tact. That could be what ends up saving him. Sean: Sam is really getting into the cases and the whole men of letters. It not only ups his game in general, but makes him much more of a go-getter as well. Plus, it was hilarious how he was trash talking Artemis in order to spin her and have her fight Zeus. Clever Sam. What did you think of Dean's last scene in calling out for Castiel? Carissa: It was good to know that Sam wasn't pulling the wool over Dean's eyes like he thought he was. Dean has become so good at hiding his feelings that Sam can't tell when he's on to him. To support Sam, Dean will keep up the ruse, but he really needs guidance and someone to talk to, and for years that someone has been Cas. After what they went through in Purgatory, Dean must feel abandoned right now. I, on the other hand, have the good fortune to know Misha Collins is bumped back up to series regular for Supernatural Season 9, so I have faith he'll save the day, and Sam! Alice: Poor Dean. He’s scared for Sam and doesn’t know what else to do. I love that he knows something is wrong with Sam and is worried instead of mad. Given that they’ve been mentioning Castiel every week, I’m sure he’s worried about him too. I know Sam and Dean were suspicious the last time they saw him but it’s obvious Dean misses and needs his friend. He knows that despite Castiel’s troubles, he can help. They all need each other now. Sean: Dean is still ready to back Sam in the hopes of victory, but there's still that sense that he fears the outcome. Calling out to Castiel and praying, something he doesn't normally like doing, means he really wants some help. He's always wanted to protect his brother and opening up emotionally like he did was nice to see. I just hope it can payoff and Sam and Dean find the win they are looking for.